It might seem oddly specific, but there’s more to finding the best golf watch for beginners than you might think. There are lots of great GPS fitness trackers out there ideally suited to golf, as well as ones specifically designed for the sport, but if you’re looking for the ones that’ll help you refine your technique and learn the lay of the land, keep reading. GPS giants Garmin and TomTom are unsurprisingly at the forefront of the golf watch game, with the former coming up trumps with our best gadget of the lot, the Garmin Approach S5. Its intuitive glove-friendly touch screen, smartphone pairing and course stats do mean that it’s among the priciest options, so if you’re just starting out and aren’t sure you can justify the spend, the GolfBuddy WTX is a slightly more cost-effective option. Overall, if you’re looking for a golf watch that’ll help you chart your progress, we advise looking for one with a buddy app and lots of in-depth stats, while for the basics, or an all-round fitness tracker, you can afford to loosen up on those search filters, because there are some great options out there. While it might not have the most beginner-friendly price of any of Garmin’s offerings, the Approach S5 is undoubtedly our best pick for functionality. Its full-colour touchscreen offers superb graphics in Green View, a birds-eye vista of whichever of the 38,000 included courses you happen to be on, and has a glove-friendly display so you can check your distance without faff. It can also be paired with your phone, to keep one eye on those vital notifications without earning disapproving looks. Reviewers found that this GPS sports watch had some of the best course coverage around, and loved the hazard function that tells you how far you are from the next trap or bunker, making it a great one for troubleshooting beginner games. One limitation that might influence buyers is a lack of aggregate data on either the app or website, so it’s more difficult to see how you’re progressing over time, however the in-game stats and scoring system are a big bonus, and seeing the hole, its number, its par, and the distance to the front, back and middle is a great help. The TomTom Golfer 2 might be the next best thing to a personal golf coach when it come to its ability to analyse your game. It automatically detects tee and approach shots on the fly as well as showing precise distances to give you the opportunity to adjust; after the fact, it gives you a hole-by-hole rundown, offering an overview of areas for improvement. That it’s lightweight, with a slim profile that sits close to the wrist, also means it won’t weigh you down unduly, and its water-resistance is sure to come in handy for hazards. If you’re after more of an all-round activity tracker that also happens to be great for golf, the Garmin Approach X40 has you covered. A solid GPS band, it does the basics, like heart rate, number of steps and calories burned, and suits a number of sports including running, swimming and cycling. Reviewers found the strap soft and comfortable compared to most golf bands, too. But what of the golfing bit? Well, with a database of 40,000 courses and fast identification, plus front, middle and back distance readings, green view, and a hazard screen, we’d say it performs admirably. Reviewers did find that this watch could take a little longer to get used to than some of our other offerings, but that the functionality was great once it got going. 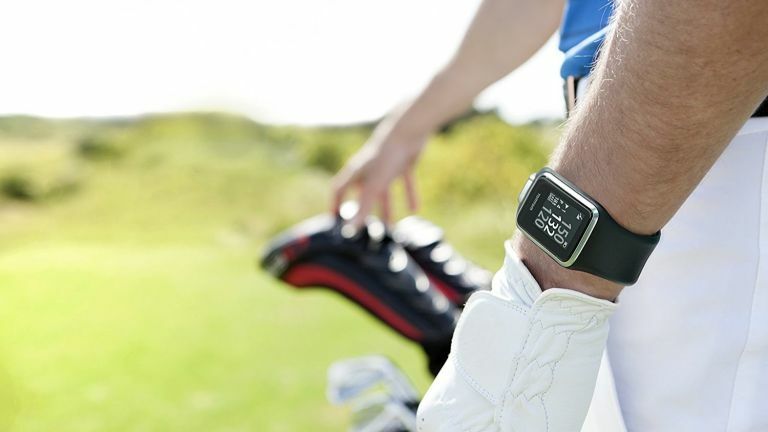 With GolfBuddy’s reputation for ultra-accurate distance measuring, the WTX was always going to be a great pal on the fairway, and users loved the clear overviews of each hole and abundance of stored courses – 38,000, to be exact – that made this all-round fitness-enhancing smart watch especially great for golf.